For what is supposed to be one of the flagship titles of DC Comics's Rebirth -- or at least prominently in the news at the time -- there's surprisingly little to Rob Williams's Suicide Squad Vol. 1: The Black Vault. Williams is a writer whom I've enjoyed, and his depiction of the Squad is tonally fine and respectful. But the main story, hampered perhaps by the page count given over to backups, doesn't have much to it; it's basically one long fight scene bookended by the Squad's journey there and back. As compared to rather complicated outings by Sean Ryan and Tim Seeley just before this, Williams's volume is slim, not seemingly the beginnings of an important and relevant Suicide Squad run. Setting aside the Rebirth special, which reintroduces Rick Flag to the Suicide Squad, the first "full" (main story) issue almost literally solely involves the Squad boarding a plane, Killer Croc throwing-up into his own altitude helmet, and Flag causing the plane to crash when he unbuckles to release Croc's helmet so Croc won't drown in his own vomit. The threat of Croc's vomit is not nearly the kind of credible foe the Squad needs to be facing right off, nor does this first issue really have any kind of arc in terms of conflict and resolution. Nor ultimately does this plane crash sequence even matter -- the Squad recovers without consequence and then continues on with their mission. Given what seemed to be some late changes regarding the inclusion of back-ups in Suicide Squad, possibly Williams's "Croc vomit" issue was supposed to be longer, ending with the present end of issue #2, where the Squad inadvertently releases General Zod from the Phantom Zone. And definitely, the inclusion of Zod -- the menacing New 52 version created by Charles Soule and Tony Daniel for Superman/Wonder Woman -- is one of the best parts of this book. But following from that reveal, Squad issues #3 and #4 simply involve the team battling Zod and a couple other random metahumans. In general there is not much here to designate this as a Suicide Squad story versus any other team of action heroes fighting other action heroes. All of that said, Williams does fine by the Squad, leavening the situations with comedy without lampooning the characters (the "Croc vomit" bit, which other writers would have played for blithe gross-out or absurdity, seems neither for Williams, just an ill-timed or ill-conceived plot point). Harley Quinn is a particularly difficult character to get right in this context, and while Williams's Harley does not quite have the zany brains of Seeley's in New Suicide Squad Vol. 4: Kill Anything, I thought Williams did particularly well balancing Harley's prattling on about neoliberalism while slaughtering foot soldiers and then also running away at the first sign of real danger. As a personal preference, after quite some time of late seeing Deadshot grow into the role of the Squad's leader, I find Rick Flag rather tepid in the spotlight, a re-tread of the New 52 ARGUS's Steve Trevor. If the back-ups, as rumored, were to give series artist Jim Lee a break, I wish Williams could have made them more relevant to the ongoing story. For someone who's been reading Suicide Squad straight through, including the Most Wanted stories, it's baffling that they've changed Deadshot's origins, for instance, so soon after they just changed them in the Deashot miniseries; Katana, too, lacks a consistent basis. And the Harley and Captain Boomerang stories are just one-off tales, not contributing enough to sufficiently replace the main story pages -- though certainly one can't argue with having the likes of Gary Frank, Ivan Reis, and Jason Fabok included in this book. I haven't read Suicide Squad Vol. 2: Going Sane yet, but my guess is that if any Rebirth series is going to read better in the deluxe hardcover that combines the first and second volumes, it's going to be Suicide Squad. Again, Rob Williams does well by the characters in Suicide Squad Vol. 1: The Black Vault, but there was less in the "vault" than I expected to find. Maybe the next outing will be more substantial. I too have enjoyed Williams work, and in a sense his Suicide Squad has potential to be great, yet the story telling method of sharing the main plot with the backups makes for a frustrating and short read. Half an issue for the story and the other half is an origin of each Squad member. While the Rebirth special focuses on getting readers up to speed on the team, the actual Black Vault story with Jim Lee as penciler is only 2 issue worth. That's what's so aggravating on the current formatting. After volume 2, Lee steps away from the series and Jon Romita Jr. takes over and the issues are more focused on the story and not the backups. Here's hoping for that improvement. I was wondering if perhaps the backups went away after Justice League vs. Suicide Squad. I'd like to see this title more up-and-running, too. I thought the 12-page lead story/8-page backup structure worked much better in the arc that will be collected in Vol. 3, because the backups were actually connected to the lead story instead of being just flashbacks spotlighting a single character. In the first two volumes, however, this structure didn't work at all for me. DC really should have just collected the entirety of "The Black Vault" in a single TPB. 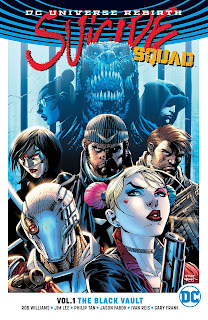 I think Williams is a great writer and the series has been improving with each arc, but what bothers me about this incarnation of the Suicide Squad is the fact that it uses the same lineup as the movie, which means only the characters who weren't in the movie are truly expendable, and every time it seems something terrible happened to one of the non-expendables, it turns out to be a fake-out. Glad to hear it gets better. I'll be picking up Vol. 3 pretty soon. I wonder if DC will put the backups all at the end again or intersperse them if they're more related. To your other point, I found this volume's "shocking death" particularly transparent; I hope that character's resurrection has consequences besides just the character coming back. This is just the first four issues, right? I read a bit of this, and couldn't remember much other than every character getting a few lines and then disappearing back into the background. It suffered from having too many characters and not nearly enough pages. Did you ever read the tail end of New Suicide Squad? Tim Seeley had a strong arc with a slimmed down roster, with a good bit of Wildstorm mixed in. Right, four issues. I did read Tim Seeley's New Suicide Squad and liked it immensely; I leapfrogged that review to get to some of the Rebirth material, but it'll be along eventually. But I didn't catch the Wildstorm references -- fill me in? There were some obscure Wildstorm characters like Deathtrap that fought with the team. Also Rose Tattoo. Wow, that's wild. I totally thought those were just Suicide Squad analogues that Seeley made up. Good for him.